Genesis Studios acclaimed series ‘So Wrong So Wright 2.0’ which launched its second season last November on Africa Independent Television (AIT) network, is currently getting great reviews from viewers across Nigeria. The second season of the series continues to follow Eki Wright (Nonso Odogwu) and his family as he continues to expose his American born kids to the rich cultural, moral and family values synonymous with Africa. So Wrong So Wright 2.0 is about to be licensed in other Anglophone and Francophone countries in Africa and it is currently enjoying massive applause in those countries. “So Wrong So Wright” first launched in 2009 and rose to be one of the most watched and awarded television dramas. Here comes January, the month when we review our eventful lives. The start of a new year represents a checkpoint, as it offers us a chance to look back on what was accomplished and look ahead to what is to come. As we embark on a new year, we have spent the first few days reviewing our strategy, operations and plans for 2019. We are convinced that our strategy and discipline will hold us in good stead through good and bad times. Here at Genesis Studios, we believe the best production is the one that best fulfills our viewers’/clients’ current and future expectations/needs. Therefore, we consider several options before recommending our productions for our clients. This year we have a new Season of Tales of Eve and So Wrong So Wright 2.0 (Season 3) productions planned to delight our viewers with. It is very easy to make New Year Resolutions, or any other decision at any other time of the year. Most times, we make the decisions in response to some emotion. However, people quite soon, lose the motivation and enthusiasm, and continue living the same kind of life. Rather than making the resolutions a decision, it’s advisable to see them as ‘intentions’. Intentions can only be realized if an individual has a clear idea of where they want to be headed, or what the change would be in terms of new behaviour patterns or routines. As you step into the New Year, remember to smile, laugh, rejoice with those who celebrate and share happiness along the way, all year round. We wish you a pleasant and productive New Year! Counting down to the end of year, we are taking stock of our successes, and reaching out to those that have touched us positively, is the essence of the season. It is indeed a good time to have a review of the highlights of 2018. We sharpened our tools, worked hard to uphold our high standards and kept the flag flying. We have continuously transformed the way we operate so as to uphold the provision of cutting edge media services to our clients. In 2018, we launched the second season of So Wrong So Wright 2.0 which is currently being aired on Africa Independent Television (AIT) and Television Continental (TVC). 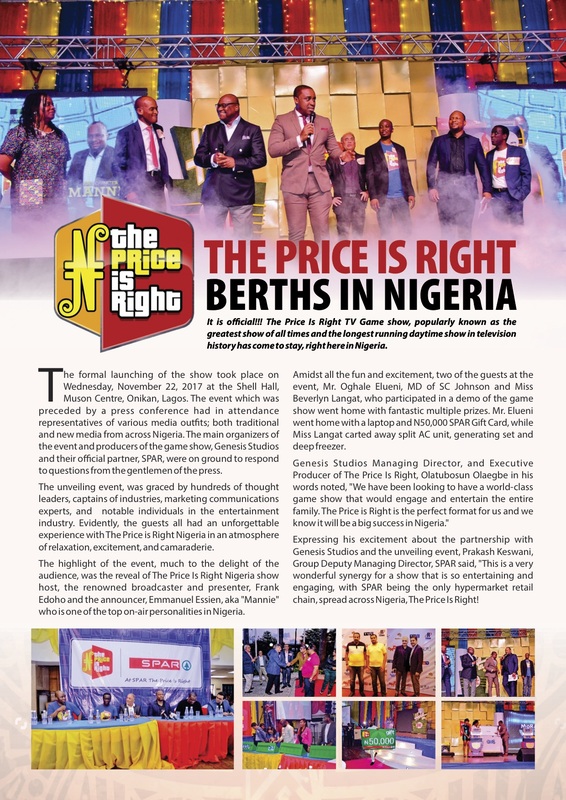 One of the most significant events of the year was the launching and full activation of our newest production, The Price Is Right Nigeria. For 2019, in response to the current trends and demands, we have expanded our reach to effectively work with various clients in every part of the world. We are set to make the New Year a profoundly rewarding year for our clients with the many opportunities each of our productions – Tales of Eve, So Wrong So Wrong, The Price Is Right Nigeria – and other shows we are about to launch can provide. Thank you for making 2018 a remarkable year for us, we hope the New Year will also be a profitable one. Don’t forget to catch the Christmas episode of So Wrong So Wright 2.0 Season Two on the 25th December at 9:00 pm. From all of us at Genesis Studios, MERRY CHRISTMAS. As the world celebrates World Television Day, we at Genesis Studios celebrate the television, one of the most powerful forms of media for communication and information dissemination. In 1996, UN General Assembly proclaimed November 21 as World Television Day to commemorate the date on which the first World Television Forum was held earlier that year. The UN invited all member states to observe the day by encouraging global exchanges of television programs focusing, among other things, on issues such as peace, security, economic and social development and cultural change enhancements. The TV cures our curiosity. Television broadens the mind by exposing people to various cultures, planets and what happens in different part of the world. For example, without TV stations like NatGeo Wild and Discovery Channel we might not know what some animals or birds look like. Television programmes creates communities. TV shows bind people together and trigger reactions on the various social networks. A typical example is Games of Thrones, The sentence “Winter is Coming” starts conversations about the next episode/season of the series. Without television, professional sports would not be recognized. We all enjoy watching our favourite sports on the various sport channels. The television employs millions of skilled labour worldwide. From Content Creators, Producers, Cinematographers, Sound Designers, Make-up and Wardrobe Stylists, Stunts guys to Directors, the success of a production creates jobs and generates revenues. Television gives voice to a good cause. It gives voice to all those in troubled zones, natural disasters and emergencies. In line with these, the television is still very important despite the world’s dependence on Social Media and today portrays that. 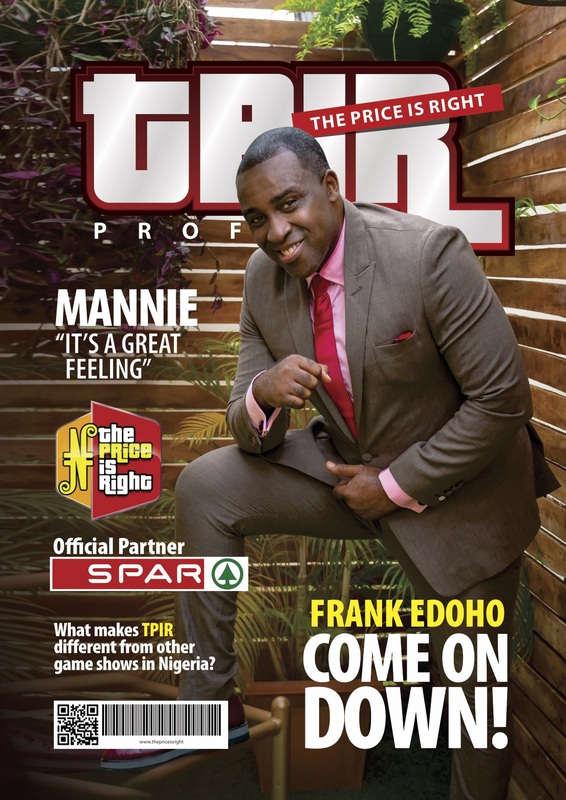 One Hundred and Thirty-Five winners have emerged from The Price Is Right Nigeria online, radio and on-ground activations. 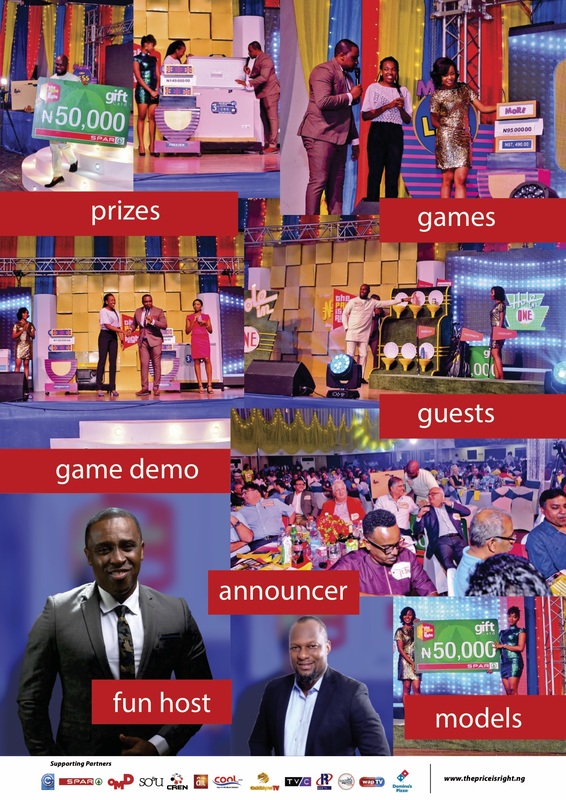 The activation is part of a series of activities used to create awareness for the game show. The online activations were done on the game show’s Instagram and Twitter handle as well as the Facebook page. The online activations had followers answering questions about the US version of the show, sponsors and other questions pertaining to the Nigerian version. Twenty-one winners emerged from the social media activations. 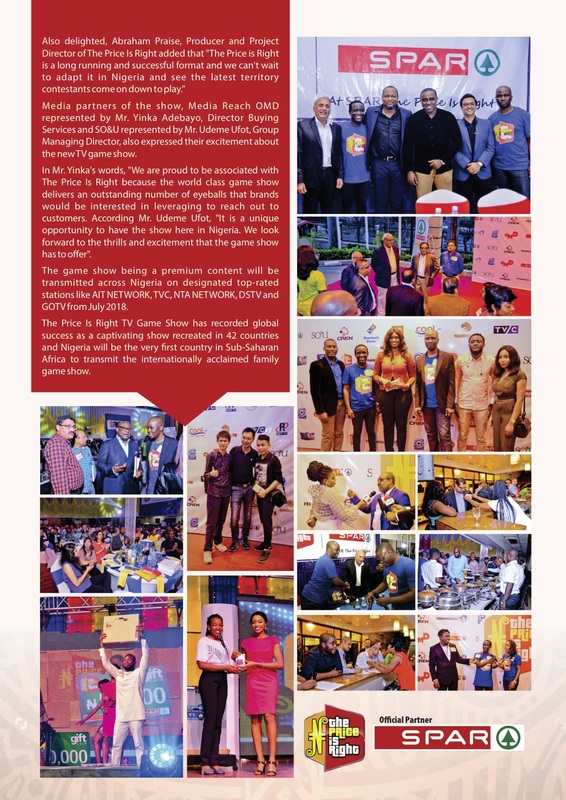 The radio version was on Cool FM’s Good Morning Nigeria Show with Mannie and Max102.3 FM with Shine. The show’s presenters asked listeners to guess the actual retail prices of some household items and the listener with the closest or exact price wins. The on-ground activation was tagged ‘Shop and Spin’ Activation in partnership with SPAR Nigeria. SPAR Nigeria walk-in customers who shop with Five Thousand Naira or more got a chance to spin and win amazing prizes. Prizes won include Deep Freezers, Music Speakers, LED TV sets, Gas Cookers, Generators, Refrigerator, Dry iron, Hair Dryers courtesy our partners, SPAR, Haier Thermocool, Binatone and F & D.
The prizes were redeemed from SPAR Ilupeju with the representatives of The Price Is Right Nigeria, SPAR and the game show announcer Mannie Essien present. The family series So Wrong So Wright 2.0 returns for a second season. In the anticipated second season, the Wright family continues to navigate the Nigerian cultural waters. The sitcom straddles the lifestyles of the Wrights and their relationships with their extended families as well as friends. The first season averaged millions of viewers per episode and is the most-watched franchise on the GS Primetime platform on Television Continental (TVC). So Wrong So Wright is a show that celebrates the essence of family and is produced by Genesis Studios, a production company known for Chat Street, Tales of Eve and The Price Is Right Nigeria.